AS SEEN AT THE COMPUTER HISTORY MUSEUM IN MOUNTAIN VIEW, CALIFORNIA! This famous cocktail napkin from the personal computer revolution of the 1980s is the perfect tool for the prospective entrepreneur. Just follow these simple steps: fill in product specs on side 1; fill in business plan on side 2; start the company in your garage; throw huge rock parties, temper tantrums, anything you wantyou have now joined the rich and famous of Silicon Valley! 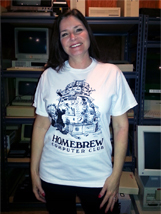 The Homebrew Computer Club held its first meeting in March 1975, in Gordon Frenchs Menlo Park, California garage. These Silicon Valley computer hobbyists and hackers went on to spur the personal computer revolution that forever changed the lives of everyone on the planet. Computer pioneers including Steve Jobs, Steve Wozniak, Lee Felsenstein, Bob Albrecht, Roger Melen, and Harry Garland went on to found influential and innovative but short-lived companies like Osborne Computers, the People's Computer Company, and Cromemco but also Apple. And all their inventions live on in every smart phone, laptop, and personal computer. 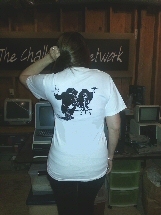 This T-shirt is the only authorized, original reproduction of Lee Felsenstein's original design from those exciting early days. 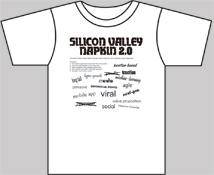 The Silicon Valley T-shirt is the wearable, upgraded version of the famous Silicon Valley napkin from the personal computer revolution of the 1980s. The napkin was designed so that a prospective entrepreneur simply fills in the check boxes for a business plan that's ready to present to a venture capitalist for funding. This new version ensures that your elevator pitch to investors includes all the right buzzwords to ensure your success. Wear it at those fancy conferences filled with desperate entrepreneurs and wannabe angel investors so that you stand out from the crowd. Silicon Valley is a state of mind where good, old-fashioned American ingenuity meets California experimentation and individualism. It's the modern day gold rush for super-smart nerds and savvy investment bankers and all of the people working for them. It's a state of mind, not a physical place. It's the spirit of innovation that will pull America out of recession. It's the next revolution in technology, science, art, and society. It's math and science and hard work and driving passion. It's all the things on this poster... and a lot more. Now get your Silicon Valley inspiration with your morning coffee. 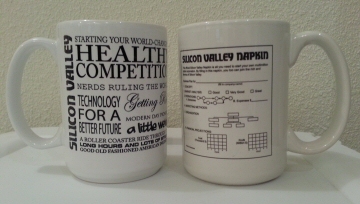 Get a Silicon Valley mug with the famous napkin on it, or get one with inspirational sayings on it. A cocktail napkin from Walker's Wagon Wheel circa late 1980s. It is designed so that a prospective entrepreneur need only complete the check boxes in order to have a business plan ready to present to a venture capitalist for funding. The napkin designer/entrepreneur Bob Zeidman tells the following story about its creation. 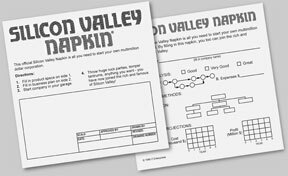 "In 1986 I created the Silicon Valley Napkin and began marketing and selling it. The printer required minimum print runs in the thousands, so I had boxes stacked to the ceiling in the kitchen of my one-bedroom apartment. By 1990, the napkin had run its course, and I still had boxes left. I approached The Garage, the precursor to the Tech Museum, to make a napkin donation. They were excited to have the napkins at their invitation-only, kickoff donor event, and I was glad to supply them. Afterwards, I thought maybe I could get my girlfriend and myself invited to this gala event and impress her by hobnobbing with the Silicon Valley bigwigs. The Garage invited us, and we mingled with, among others, Andy Grove, Ed Zschau, and Margaret Wozniak (filling in for her son Steve who couldn't make it at the last minute). Sitting at the table I asked the man on my right what he did for a living. He waved his arms around his head, "embracing" the room, and told me his company had designed the museum's interior space. Cool! I turned to the man on my left and asked him what he did for a living. He was the founder and CEO of a biotech firm in Berkeley. Wow! They both asked me what I did and, a little sheepishly, I picked up a napkin, proclaimed that I had supplied the napkins for tonight's event, and wiped the béarnaise sauce from my mouth. As a footnote, my girlfriend at the time is now my wife. I guess she was sufficiently impressed."